does not work. When you click on unsubscribe it doesn't take you anywhere. I thought it was Federal law that we are suppose to be able to unsubscribe to any emails we choose to. Please fix this error, I have been trying for over 6 months to fix this error. Welcome to the Forum. Sorry for the experience you've had trying to unsubscribe from our emails. I was able to open the link and I get the options to "Customize What I Receive", or "Unsubscribe From All Emails." Which browser are you using? I'm using Chrome. Can you clear your cache and cookies and try again? Sorry, I am using the latest firefox, have cleared my cache and using a desktop with Microsoft windows 7 professional. I have also tried using a desktop that had latest Microsoft explorer, Windows 10 with cache cleared. And a laptop with the latest chrome and windows 10. 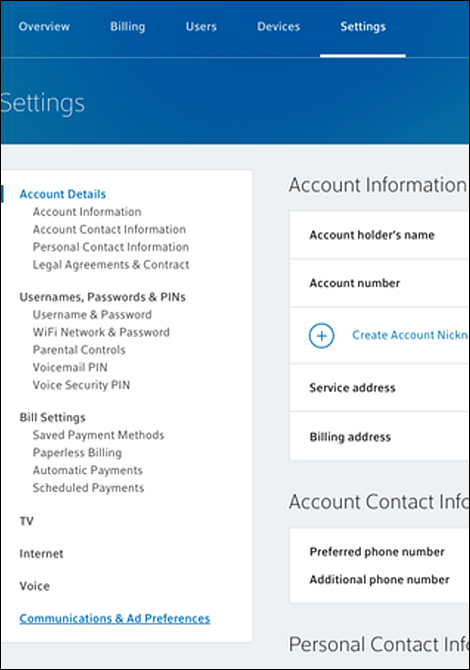 I can access any link in comcast, but the one I posted. As I found in other post people are complaining about a bad script for that particular link. Either way I think it should be submitted to be checked out since I am not the only one with the problem. And trying on 3 different computers at 3 different locations, it is not on my end. Thanks for the clarity. I'll pass this information along. But it will be hard to investigate if we aren't able to duplicate this on our end. Can you verify whether or not you are able to opt out using the following steps? Click the Settings tab at the top of the page. Click Communications & Ad Preferences on the left side of the page. Scroll down to Advertising Preferences and click Manage Permissions under the Digital Targeted Advertising section. A new tab will open. Click the Opt Out button. Please note that your request may take up to 72 hours to process. 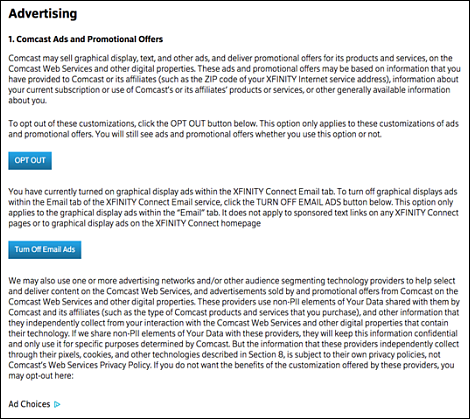 You can also click Turn Off Email Ads to opt out of the advertisements that appear in the Email tab of Xfinity Connect. Scroll down and click Ad Choices under Partner Ads. The Your Advertising Choices pop-up window will appear. 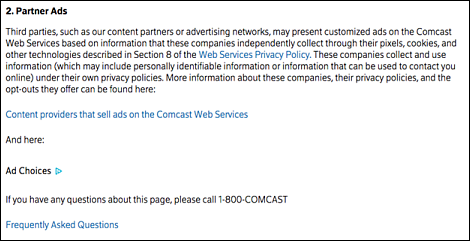 Check the box for any Ad Partner from which you would prefer not to receive advertisements and click Submit Opt-outs.